Street Legal ATVs. Can You Ride Them in the USA? Guide to Street Legal ATVs. Are there really any street legal ATVs in the USA? Good question - and the answer is a qualified yes and no! A few states like Arizona and New Mexico do license ATVs for street use. Street legal quads are allowed to operate within certain areas in some other states. West Virginia, Michigan, and Pennsylvania are some that we know of. To those of you in those areas we say congrats - and spare a thought for the rest of us out here in the vast wasteland. But rather than fret about what we can't do - let's take a look at what is possible under the law as it stands today. Let's look at the street part of street legal ATVs first. The Can Am Spyder can be licensed as a motorcycle. Turns out that 3 wheel vehicles are street legal in most parts of the country (USA). They are usually licensed as motorcycles and require a motorcycle driver's license. The Can Am Spyder is the most recent example of a vehicle that meets those requirements. "But that's not an ATV" you say. True - but let's look at what might be possible within that set of rules. The Brudeli Leanster is based on a KTM dual sport motorcycle. This is called the Brudeli Leanster. Based on a KTM dual sport bike - it's a three wheeler that leans like a motorcycle. It should be street legal in all 50 states (or at least everywhere the Can Am Spyder is). So you're thinking "Looks like a street bike" - "Where's the all terrain part"? The Leanster has outstanding off-road performance. How about here? Think you sport quad guys could get into some of this? I gotta tell you, as an old dual sport/adventure tour bike rider, this looks fantastic! Think about it - Street legal ATVs you could ride to your favorite trails while carving a few asphalt curves on the way! The track width will easily fit any 50" ATV trail restrictions. You have unmatched ground clearance and suspension travel. No pick up truck or trailer required. And it's all based on reliable motorcycle technology and components. Now for the bad news. These are made by a small specialty company in Europe so the prices are out of reach for most of us at over $26,000. But there are companies that could build these at an affordable price if they thought the demand was there. KTM and Can Am are already in the ATV market. Can Am already builds a trike - why not a dirt capable model like this? Both companies have shown the courage to be innovative trend setters, so why not? Street legal ATVs would be a natural fit for both of them. The Piaggio three wheel scooter. Then you have a company like Piaggio that has sold this 3 wheel scooter for several years now. If you had any doubts that the concept works - this thing gets rave reviews from everyone that rides it. I tried one myself and I can tell you it's an absolute blast! The front has a more stable feel than a bike and you don't worry about every gravel patch or oil slick you see. Personally, I think leaning with the machine is more comfortable than trying to stay on the seat like you do with the Can Am. They're both fun - I just prefer to lean. 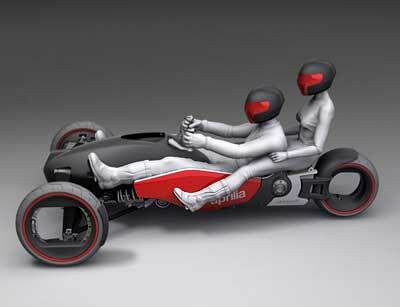 Aprilla Magnet three wheel concept vehicle. 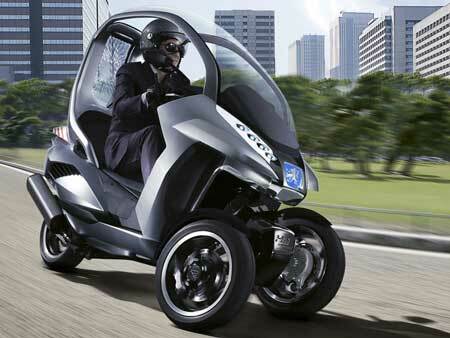 Piaggio has connections to Aprilla which recently showed a 3 wheel concept vehicle of their own. The Magnet. Aprilla builds some killer bikes and has a reputation for out of the box thinking. They could easily build street legal ATVs. This is kinda what would happen if an F1 car was rear ended by a Harley chopper! This is obviously strictly for the street but it just shows another way to go with the 3 wheel concept. It also shows that Aprilla may be looking at ways to expand the use of 3 wheelers. The Magnet features a hybrid drive system. The wheels are driven by electro-magnets that are supplied by batteries that are charged by a 500 cc single cylinder engine. Hey, this is a hybrid I could learn to love. At least it shows that green transportation doesn't have to be boring! Even car companies like Peugeot are getting on the three wheeler bandwagon. Basically Piaggio MP3 scooter meets commuter car. The two front wheels are powered by in-wheel electric motors while the rear wheel is powered by a small single cylinder four stroke engine. A true hybrid, the trike can run on just the electric motors in front, just the gas engine at the rear, or both front and rear power sources at the same time. Peugeot sees a vehicle like this as a solution for urban commuters. 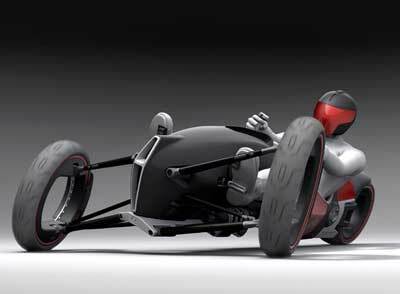 This might be the future of personal transportation. 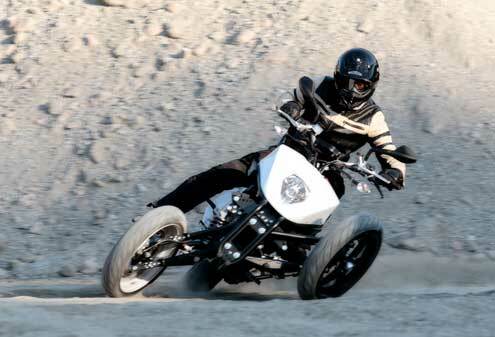 A blending of motorcycle, ATV, and auto technologies into one multi-purpose vehicle. That may not be a bad thing - 100+ mpg, eco-friendly, go anywhere - do anything, street legal ATVs. Street Quads - Overview of street legal four wheelers around the world. 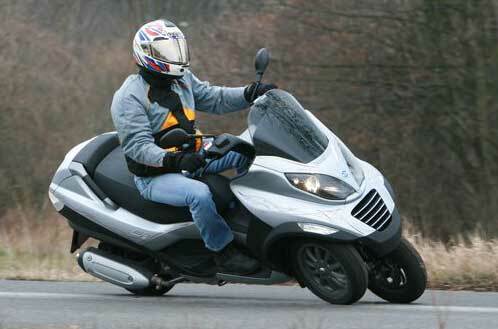 Street legal quads - Report on European ATVs for the street. 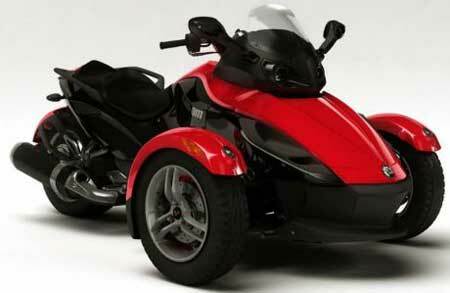 Can Am Spyder Guide - Review of the Can Am three wheeler for the street. Return to Street Legal ATV Guide from Street Legal ATVs.